With ‘going Dutch’ and padding down for greater flexibility in save making, the skin is left vulnerable to getting shredded on tough sand based pitches. As has been said goalkeepers are amazing people! Ingeniously, some keepers have come up with the idea of wearing medical tubular bandages; allowing them to protect their skin without losing any mobility at the elbow for those all important reflex glove saves. What with goalkeepers being amazing people, there are a few tricks used to match the way they play. Given that ‘going Dutch’ when playing on nasty surfaces and sliding around can give you the result of some dodgy turf burns, some keepers have attempted to find a suitable solution. This innovative method makes use of the support bandages used for sports injury rehab, which are readily available in pharmacies, to counter the effects of a dodgy pitch surface. Whilst some ‘keepers wear elbow guards purely to prevent being ‘skinned’ when diving or sliding out along the pitch, the tubigrip allows the goalkeeper to cover the bare elbow skin without compromising movement; leaving the elbow with full freedom of movement for those dramatic reflex saves. You can easily get tubigrips at pharmaceutical stores or chemist’s (like Boots over here in the UK), and general health shops. If you don’t want the hassle of popping down to the local chemist’s and prefer the Internet sales, as well as being able to get it delivered to your door, then you can shop online! 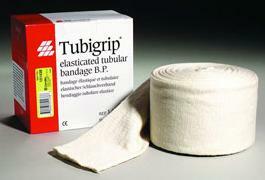 Go onto Google or Ebay and simply search for ‘tubigrip’ or ‘tubular bandage’ from health store websites. The tubi-grip is supplied as one long length, which you will need to cut down to size. The grip itself needs to double back over itself to provide an extra layer (for greater coverage, and a thicker barrier, against the pitch) and maintain the elastic springiness that keeps it in place. 15 centimetres is a suitable length of ample coverage for the elbow, so you will want to cut the length to approximately 30 centimetres long for one elbow. Measure out the required length, and then evenly cut across the width to give yourself a new elbow cover. Material scissors work better, but any scissors should do. When putting it on, the tubigrip easily slips onto the arm. Put the grip on as the full length, covering the elbow, and then fold it back on itself to double-up (with equal length covering before and after the elbow, for extra surface protection for the skin around the elbow). As mentioned, halving it, as suggested by the company information, gives a stronger ‘wrap’ around the arm, as well as providing an extra layer of protection for the skin. A lot of keepers wear just one on their left arm, as they leave the glove arm unprotected for extra movement in directing and controlling the ball on a glove save; covering up the right with an elbow pad. If you ‘go Dutch’, then you’ll want to cover up the right elbow, to slide on, as you haven’t got an elbow pad on to protect your skin from burns. If you tend to slide on your left as well (especially when block sliding to the left), or are quite acrobatic and athletic; flinging yourself around to intercept or disrupt plays, then it is a good idea to cover up both elbows to protect them from turf burns. A further optional use for tubigrips is to wear them over elbow pads; this way they act as a barrier between the pitch surface, to protect and prevent the elbow pad from wearing down so easily when sliding. If you wear sleeveless jerseys, then the padding is left uncovered and can get worn out when rubbing with the pitch. 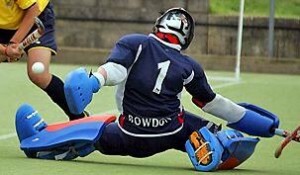 I have previously worn elbow guards, which easily get shredded and worn out when sliding around on a sand based pitch. When sizing the tubigrip to match the elbow pad, you need to take into consideration its size (measuring the pad length, and then doubling that for the needed overlap of the second layer when folding). To match the width, check how flexible the grip is to make sure you can stretch it over the elbow pad. When wearing the grip over the elbow pad; kit up normally, putting the elbow pad on, and then slide the grip over the elbow pad with the help of your free arm. You can then peel it off and remove it, after the game has ended. It is also possible to wear tubigrips over the arm pads (to cover pads if you wear a short sleeve smock); you will have to cut the grip longer to cover the arm pad (to reach the sleeve on the jersey). Remember to wash them afterwards to keep them nice and clean, as well as getting rid of dirt, bacteria and the like! Tubigrips cannot be machine washed because of the materials they are made of, which would get destroyed in the heat of a machine wash (like polyamide). It is best to wash them by hand, as instructed by the details on the pack they come in. Fill a bucket with cold or luke warm water and washing powder (or the hand wash option on your washing machine, if you have it), and then soak and scrub them clean. Leave them out to dry to get rid of the sweat; you can use air freshener (like “Fabreeze”) for the smell! As a goalkeeper intent on making it big, you should always consider how well you played in the game. You may think you’ve done your best, but there’s always something you could have done better, or a play you could have prevented. Even if you played a ‘blinding’ game and kept a clean sheet, there are still things that you can work on! Seeing every game as an opportunity to improve, instead of being already being ‘perfect’ will help you greatly in developing your own game in order to succeed as best you can. Remember: goalkeeping is a journey of develop, and by the time you reach your peak, you will be more of a finished product, in your overall understanding of the game and therefore ability to control the play, compared to when you first started in ‘between the sticks’. Weaknesses are basically areas of the game that still need to be worked on. If you are aware , then you need to work twice as hard to get rid of those bad habits. Not all of our potential weaknesses are down to skills and abilities though; a poor mental approach to the game could leave the team in disarray as the goalkeeper ‘folds’ under the pressure. By analysing your mistakes in the game, and what you should have done or could have done better to reduce the number of shots you faced, or improper technique, in using the wrong save for the situation, or poor technique resulting in the opposition gaining possession of the ball, like a weak clearance. Looking back at the game will help you work out what needs improving; practising a different save may be a better way of controlling the rebound. Discuss with your coach what you need to work on, and always look to improve yourself: if you want to be the best of the best, you’ll have to work for it. A great idea is to keep a record of your games, using a paper flip book or storing documents on a computer. After each game I like to evaluate my performance in order too isolate weaknesses and see what needs working order to successfully win tight games where the all-important save is decisive, so I don’t make the same mistake twice. Writing down what I did well, what goals I let in; when they occurred (i.e. if late in the game as a result of reduced concentration), how I could have actually stopped them going in, and what I did wrong, I can analyse key areas of my own game. This way I can keep track of weaknesses and trouble spot areas within the game, like set-plays (if they are a recurring problem), so I don’t commit them again in the next game, as well as staying aware of my strengths. Although it is good to put a bad game behind you and focus on the next, it is more important to work out what needs working on and prevent it from happening again. This way, you will ultimately improve and play better, to your full potential. Team trainings are necessary in developing the tactical skills a goalkeeper needs. 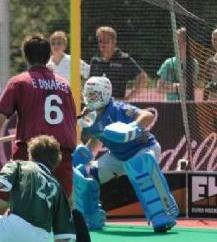 It also enables the goalie to become an integral part of the teams defence and makes the defence trust his directions. cialis pills But the team training is not fit to train the specialist technical skills a goalkeeper needs. It is therefore imperative for the development of the goalkeeper that he receives specialised training to improve these skills. These specialist trainings require a special kind of coach who can bring out the best in his pupils. What is a Goalkeeping Coach? There are a lot of answers to the above question. In short it can be said that a GK coach is someone who facilitates the development and improvement of a goalkeeper both physically/technically and mentally. This sounds like two different fields, but in practice these are interwoven at the base of everything a goalkeepr does. Contrary to a team coach who has a 1-on-many job, the GK coach has a 1-on-1 relationship with the goalkeeper. Even when training a group, you work with just 1 individual at a time. Therefore a GK coach must establish a bond of trust and friendship with his pupils. The goalkeeper must trust the coach to have his best interests at heart, but also not be afraid to speak his mind when he has a different view on things. This bond is established not by just feeding balls, but by the way feedback is given, the GK’s ideas and views are discussed and by talking about the GK’s feelings about the team, the training and the games. In some occasions it can happen that during an entire training not a single ball is played because all the goalie needs is a good pep-talk and a venting of his frustrations and feeling. A goalkeeper has a special place in the team, this comes with special privileges and cool gear, but it requires a special mental state. The GK can never be a match winner in the way an attacker can, but he can play a decisive role in the mental state of the entire team. A brilliant save can give the team the boost they need to turn the match in their favour. Also the GK must be ready for action during the entire game, not just physically, but also mentally. It can happen that a GK doesn’t have to do anything for the entire game, but must make a match winning save in the last minute. This requires a lot from the GK’s mental ability. A GK coach must train his pupils to develop split second decision making, to never give up and be confident in themselves. A relaxed and controlled mind ensures relaxed and controlled movements. The specialist skills a GK requires demand a different physical state than that of his teammates. A thorough stamina base is required to be able to fulfil the full 70 minutes of a game as a GK is hardly ever substituted, but next to that core strength, sprint strength and quick recovery is needed. Core strength is essential for a good ready position and explosive reflexes. Sprint strength is required because the short distances a GK needs to cover. 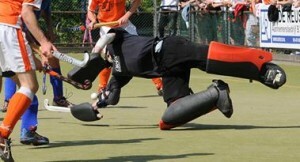 And quick recovery is needed to be ready within a split second after each save. The technical execution of the specialist GK skills must be trained by repetition and direct feedback. Repetition trains muscle memory and reduces reaction time, essential for any Goalkeeper. The feedback must prevent errors becoming habit. The more control the GK has over his body, the better the execution of skills and the more controlled the movements will be. To achieve the above states the GK coach must design his training sessions to the GK’s specific needs. The aim is to reduce the weak points and further improve the good points. Often GK-coaches concentrate too much on improving weak points, while further perfecting a GK’s strong points can prove a more solid alternative to substitute the weaker technique. For example: low stick/glove dive vs. splits. The technique trainings are a means to give the GK confidence in his abilities and the feeling that he can save every ball. Drills with rebounds or extra attackers train the decision making abilities of a GK. Ask the GK to think of all the pro’s and con’s of different techniques to save a situation and show them in a drill. This is a very good method to enhance problem solving abilities. The key is to push the GK to beyond his limits in a positive way, thus increasing his enjoyment of the game and making him want to be an even better Goalkeeper. If you want to be a GK coach be ready to invest a lot of time. Watch games of your pupils to find their weak/strong points, research other keepers to see different styles, keep up to date with developments and set goals not only for your pupils, but for yourself as well. Be creative when thinking up drills, don’t be afraid to use unconventional training aids. Make the drills realistic, designed to replicate game situations and suited to the level of play of the GK. Be critical to the way you are coaching to improve your didactical and psychological skills and make sure your hockey skills are up to the task. But the most important thing is: Enjoy! There is nothing more rewarding then seeing one of your pupils making a world class save and leaving the pitch with a big smile on his face because he saved the championship. So close! 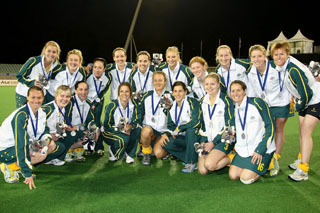 The 2009 Samsung Champions trophy is over and we are going home with silver. In the most intense game of the tournament the Hockeyroos went down to Argentina in strokes after staying at 0-0 after full time then extra time. It was a battle of the midfields with neither team having many good scoring opportunities. Luciana Aymar who sealed the deal for the Argies by scoring the final stroke. It was tough watching them sing and dance around but we all left feeling very proud of our performance. It was another step forward for us and so we will know head back home to train for the World Cup qualifiers in NZ in August. Here is a team snap shot. An important feature of your ready stance is your glove positioning. If you keep your hands low and inactive, out of the way where they can only block low, you make them effectively useless; taking them out of action for a raised save. However, by bringing them up, where you can then be able to move with greater reaction to counter act the speed of the shot. As raised drag flicks are virtually unstoppable when roofed into the top corners, it is important to try and combat this. With your gloves in front of your body, you do not have to bring the arm up on the save; this makes it easy to get your glove on saves to control the shot and rebounds, rather than missing the shot entirely. 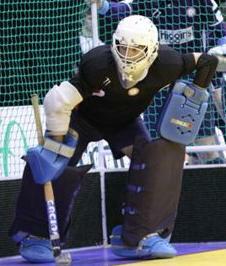 A raised glove stance is a technique used by soccer and ice hockey goalies to maximise shot stopping abilities by ‘being set’ before the shot, and works just as well when applied to hockey. The theory behind it is that with your gloves already ready; in position for the immediate save, you do not have to move as much on reacting to the shot. The closer you are to the ball, the less you have to react to the shot, due to forward preparation. It makes life easier shot stopping as you close down the shooter’s options, speeding up your reaction to the shot as you have more time to react by being nearer the incoming ball. Being pro-active with your stance, you can actively challenge the shooter; covering space and limiting their shooting options. Mentally and physically ready for the shot, you are set before the play more able to deal with the impending strike. There is a tendency to routinely forget or ignore a proper ready stance, and be lazy in positioning your gloves, simply letting them drop to your sides. Limiting yourself in your ability to save shots by being held back against the incoming shot is not good: against a fast strike, you cannot react in time to stop it properly. The further your gloves are from the ball, the harder the save is; reacting late to the shot as it comes in and requiring you to lift your arms up high within an instant, whilst covering less space (so the shooter can see more of the goal, and you cannot close off options). With your hands ‘back’ and close to your body, you are limiting your ability to make saves. There is also the possibility of interference, with your arms rubbing and bashing into your body, as you lock them into your stance, which can prevent full range of movement. Trying to be over reliant on reflexes is a bad idea – you simply cannot stop high shots with a low glove position. You can make the best use of your reflexes by having your hands already up for the save; increasing your reaction speeds against the shot and therefore reacting immediately, gaining the edge needed to stop the ball. With your gloves out in front of you, you can get behind the save more easily; with more power and speed. Logically, you are closer to the ball on the raised shot: the closer you are, the less you have to react (as you are already in position for the save) and can therefore reduce reaction times for a fast reflex save against screened shots or quick shots. By pushing out with strong momentum, and less distance to travel to meet the ball, you can power into the save and force the rebound away further, with the momentum. 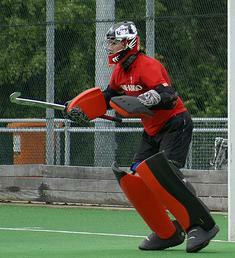 In contrast, to a stance with your gloves placed down by your sides, you can be more flexible and active with your hands out, getting your gloves on every shot that comes your way; pro-actively reacting to shots, with greater movement and fluidity, rather than trying to push into saves outside your comfort zone (if playing a tighter stance). With your hands out in front of your body, you have less work to do, enabling you to react quicker with greater aptitude. Against drag flicks, with great height and speed (i.e. crossbar height), it is impossible to bring your gloves up high enough from a low starting position to reach into a raised save; therefore, by having the gloves up and out in the space, you stand a better chance of reaching the ball on time. Gravity works the same way, so it is easier to drop your gloves for a lower save, as you can quickly bring your glove down, facing the ball, to build up a blocking barrier (if needs be around the hip), when dealing with a shot around the body. If you face a lower shot than expected within this position, then you can simply bring your gloves down; reacting to the danger as it presents itself and blocking instinctively. Working on strengthening your arms will help you in being able to hold your gloves out in your stance (without getting tired and then lazy) for the full length of the game, especially if you use a heavy stick – weight training (for keepers aged 16 and over) can be helpful with this. Wrist weights on the hands also be useful in building up resistance on glove positioning. Fransisco Cortes of Club Egara (current Spanish number 1 keeper) is a great example to watch and learn from; he has a ready stance with his gloves far forward, consistently positioning all the time, in every game situation, in order to be active with his glove saves. You can watch highlights of him in action at the Euro Hockey league website , or search for “Spain hockey” or “Club Egara” on YouTube. Vogels (the well known Dutch no. 1) also uses the same glove positioning, out in front of his body (search for “Netherlands hockey”, “HGC”, or “Hoofdklasse” on YouTube to watch him in action). The key to having your gloves out for saves, is making it become a standard thing. To make sure you are doing it, you have to programme your mind to get set in the same stance all the time. Train yourself to get into a proper hand stance every time you set for the shot, so that it becomes automatic during games. In training purposefully practise with your gloves out on all shots; this will then transfer into games where you will find yourself automatically pushing your gloves out. Ultimately, it is up to the individual to decide how you position your gloves, but having the gloves out does improve the ability to stop shots around you, with greater capability. It is not being passive, but the opposite; you are quicker moving into the save than when trying to push out from a tight stance, with the gloves close into the body, taking advantage of reaction times on really fast shots, to give yourself the best fighting chance of a save. Author Dan PilgrimPosted on July 19, 2009 Categories Advanced SkillsLeave a comment on Keep your gloves in front of your body! Wow, what an exciting week we have had at champions Trophy. Last night we smashed the poms 4-0 in a great game in the freezing and wet Sydney weather. Wizza (Nic Arrold) scored two awesome short corner flicks, which were then topped off with goals to Casey and Hope. Everyone was really pleased with the win which puts us one win away from the 1v2 final. We play the Dutch tomorrow and have to beat them to secure a spot against the Argies on Sunday. Cant wait. Keep an eye out on fox sports for the game. We have played 2 games now and we are sitting at one and one. Yesterday we beat Germany in a great performance 2-0 but unfortunately couldn’t back it up today and went down to the Argies 1-0. It was a tight game and my first experience with the video ref. A goal was scored which was controversial so the umpires went to the 3rd umpire. It was very tense. The goal was not given. The team was all in pink today in support of the National Breast Cancer Foundation which looked so great. We all enjoyed doing something good for a great cause and the crowd all loved our uniforms. Here is an action shot from the game showing off the kit. We have a rest day tomorrow which we are all looking forward to after the two first tough matches. > Australia beat Germany for the first time in two years in CT competition. > Australia’s last win over Germany before today, came in the first round of the 2007 CT (2-1). > At the age of 19 years and 160 days Emily Hurtz became the third youngest Hockeyroo ever to score a Champions Trophy goal. > Only Karen Smith (age 18 in 1987) and Casey Eastham (age 19 in 2008) were younger than Hurtz when they scored for Australia at the Champions Trophy. > Madonna Blyth scored her fifth goal in CT history. Three of these goals have come against Germany. The foam chest pad offers the goalkeeper basic protection to their upper body, whilst providing them with flexible options as to how they ‘pad up’. Unlike full body armour, chest pads do not have shoulder protection or arm pads attached, allowing the keeper to choose protective options to suit their style, such as wearing elbow pads alongside the body pad instead of full arms. There are a lot of goalkeepers, who play with a basic chest or body pad, allowing them the freedom of movement to make reactive saves on the play, with the extended ability to circulate their shoulder joints and move freely without stiff arm pads limiting extension of the arms. Generally made out of foam type materials, but increasingly using harder plastic padding for higher levels of play, they feature a basic plate to cover the body, with straps around your back and arms to secure it in place. If the chest pad does not cover your ribs or abdomen properly, especially if there is a gap between it and your shorts (which can leave you vulnerable when exposed on plays where the play is tight and the shooter has the time to ‘wind up’ on their shot, like a close in, raised shot from about 5 feet away, with potential bruising or being ‘winded’ on the shot), then you may want to look for better padding. Consider your options when purchasing – don’t just go for a chest pad because you like its price; the cheaper they are, the less foam there is. The cost reflects the thickness of the foam and you want something with a suitable degree of protection to look after your important internal organs and prevent broken ribs. At low levels, for youngsters who will not face hard shots to these scary areas, and beginners who may not decide to play the position long, these are great, but don’t put yourself in pointless danger. Common manufacturers include all the main companies, like Monarch, Mercian, and Grays in the UK, along with Mazon (Australia), and Brabo (the Netherlands), providing general foam padding chest pads for lower level games. Mercian’s old T-pro plate design (which is now outdated as the manufacturing machine broke) offers a hard plastic sheet for shot stopping, with added abdominal guards for extra protection to the stomach area. TK produces a far more protective international version, based on segmented plastic square inserts covering the body, which ‘block’ the ball, absorbing the impact of the ball, by ‘spreading’ out the force of the shot. The thick plastic means there is more behind it, compared to thin foam. Obo’s chest pad design (which comes separately to the arm pads) uses high density foam for maximum protection in order to absorb the impact of the shot; more vulnerable areas have dual density foam. Its design incorporates 38 individual inserts, which means that there is no ‘bunching’ (that would otherwise compromise flexible movement) when moving, or lying down against a shot. 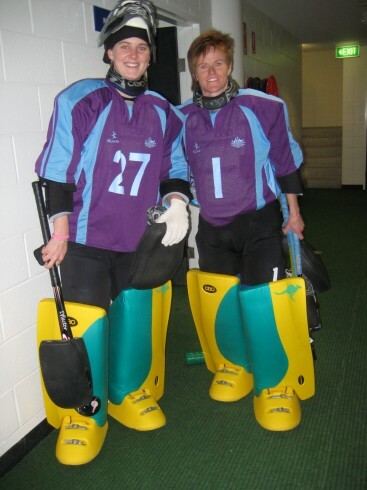 Here are a few snaps from the Sunrise News Channel 7 that featured some footage of our training…so we took the chance to show off our custom Hockeyroos pads. We begin the Samsung Hockey Champions Trophy campaign on Saturday against Germany.